Police are appealing for information after a taxi marshal was assaulted in Burnley. Officers were called around 1am on Sunday, September 9th, following reports a man had been assaulted in St James Street. Around 15 minutes earlier, a 61-year-old man had been marshalling taxis when he was approached by another man. The man racially abused the victim before punching him in the face. He hit the 61-year-old man a second time, leaving the man with a broken jaw. The attacker is described as white, of slim build with short, red hair. He was wearing a white shirt, pink tie and black trousers. 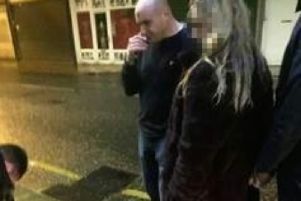 Following CCTV enquiries, police would like to speak to this man, pictured, in connection with the assault. PC Estelle James, of Blackburn Police, said: “Do you recognise this man? We want to identify him after a serious assault in Burnley. “The victim was racially abused before suffering a broken jaw in an unprovoked attack. If you know the man pictured, please call police on 101 or email 3510@lancashire.pnn.police.uk quoting log EF1813995.